Please state your current profile. I am currently a Young India Fellow (YIF) at Ashoka University. 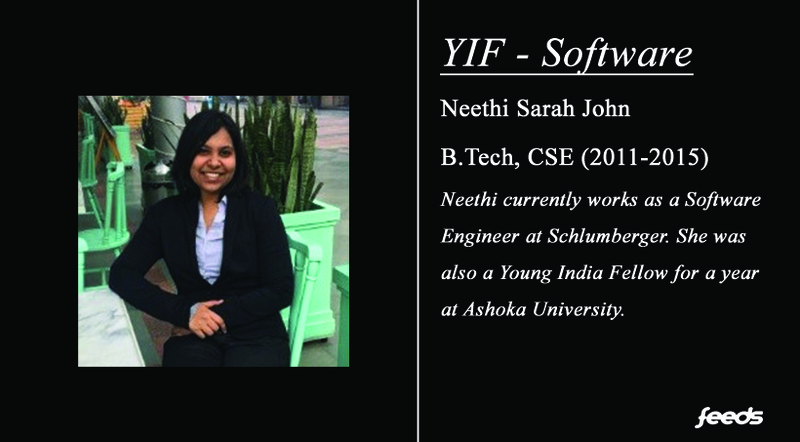 Before joining the YIF, I was working as a software engineer at Schlumberger Pune Tech Centre. I am from the 2015 batch of B.Tech CSE. Why did you choose YIF over other career options? What makes YIF different from other fellowships? I was attracted by the idea the YIF right from my final year of college, when a senior from Balls by Picasso told me all about it. There are several NITT alumni who have chosen to join YIF. YIF seemed fascinating to me because it is the only liberal arts programme of its kind in India, and it boasts of faculty from the best universities in the world, including Harvard, Stanford, Oxford, UPenn and the like. I was also enamoured by the fact that my science background did not stop me from learning subjects like history, art, political science, economics, literature or philosophy with other students from myriad fields. As far as choosing other career options is concerned, I took the safe route of a one-year sabbatical from my Schlumberger office to pursue the YIF. However, a majority of the other fellows have come to the YIF either straight from their undergraduate degrees or have left their previous careers to start anew. What are some of the main qualities that applicants are screened for? The first thing that the interviewer looks for is how much an applicant wants to join the fellowship. I think this is the case for any other interview as well. Other qualities that an ideal applicant should have are a thirst for knowledge, a desire to change India for the better through service or entrepreneurship, and a well-rounded personality. The ability to learn things quickly is imperative in YIF because nearly all the subjects will be alien to engineering graduates. Extra-curricular activities and leadership positions should also give a boost to the application. What are your main takeaways from YIF? What avenues does a postgraduate diploma in liberal arts open up for you? The first thing that YIF did is to open my eyes to new knowledge and possibilities. Each and every course had some lasting impact on me. There is a strong focus on economics and policy-related fields, which I think any educated person should know the basics of. I have become more open-minded and aware of Indian realities. As engineering grads, we don’t pay enough attention to the very real struggles of ordinary people in India, such as agricultural distress, poverty, judicial processes, or the inefficiencies of government policies. YIF taught me not only to read and learn about these issues, but also to act on them through policy competitions, case studies, and in choosing future careers in government or NGOs. Another thing that the YIF stresses on is the importance of original thinking. Plagiarism is simply not tolerated in any of the courses here. It has the good effect of awakening the creativity and curiosity that is innate in each and every person. How did YIF shape your perspective career-wise? I realized that as engineers, we have been pigeonholed too quickly into our respective branches. We barely know what students in other engineering disciplines are learning, let alone other streams such as pure sciences, commerce and humanities. Since students at YIF come from very different fields, I got to know of so many different career choices. I also have the courage to go for a Masters degree in unconventional career paths. As of now, I do not have any entrepreneurial plans, but a few of my friends here have chosen to start new ventures. The Entrepreneurship Cell at Ashoka University is very active and supportive of such ideas. How permanent is any choice of career? Do you think one should stick to a particular field or keep changing and experimenting as they grow in the industry? My mom often quotes this proverb: “A rolling stone gathers no moss.” Yes, there are people who frequently switch careers even in their 40s and 50s, but those are extreme examples of the proverb. I think that it is completely okay to change careers when you are fully convinced of what you want to do and there is scope to achieve it. Only very few lucky people make the right choice after class 10 and go on to choose a stream or a bachelor’s degree that they are actually passionate about. Most people discover their true passion only after making an uninformed choice in their teens – but it shouldn’t stop them from following their dreams later in life. The easiest way to choose another career path is to complete a Master’s in that subject. For a successful application, the admissions committee should be convinced of your reason to shift and how ready you are for the change. It will be helpful if you use knowledge gained in your Bachelor’s degree as well. For example, I wanted to shift to a career in Public Policy. I chose to apply to those degree programs that had a combination of Data Science and Public Policy, so that my educational background isn’t a waste. What is the extent that one should go to find a balance between work satisfaction and monetary satisfaction? This will differ from person to person, depending on their risk appetite. Some people need a large cushion in case of future emergencies such as health problems or other family concerns. We all know how expensive healthcare is in India, especially for serious illnesses. It would be a mistake to say that money does not matter at all, because it does to an extent. Work satisfaction is far more important in the long run for my own mental wellbeing and for those around me. How can one be sure that a certain career path is right for them? What is a good way to make that decision? Again, this is a difficult philosophical question to answer. Work should make you feel fully engaged and be a source rather than a drain of energy. James Clawson from the University of Virginia even argues that finding your resonance and investing in that source of resonance should be the purpose of life itself. If your source of resonance also satisfies monetary concerns, nothing could be better! Is there something the T and P cell can do which does not even come under its umbrella currently, but is important? One thing that the T and P cell could work on in the future is providing career counselling to students who are unsure of what career path to take. It would be nice to have a database of alumni, industry leaders, and professors that current students could contact for career advice through T and P. It could also look into providing information about different projects and fellowships by state and central governments, such as CMGGA or Telangana Chief Minister Fellowship. I’m not aware of how the T and P disseminates information currently, but regular e-mail updates to students about upcoming opportunities in careers or higher studies would be a good idea. What are some things about your career path you wish you knew in college, in retrospect? I wish I knew the importance of doing projects and competitions apart from coursework in my chosen field. Several students already know this in college, but I was not one of those enlightened souls. By doing projects, I could have much more understanding on what my career path actually entails. I also wish that I took my academics more seriously. I cannot emphasise enough how much a consistent academic record matters – from placements to Master’s to an MBA, to anything else you want to do later in life. I would advise everyone to visit professors for office hours in case of doubts, and keep bugging your fellow classmates to explain difficult concepts. If both don’t work out for you, try YouTube videos or online courses. What must one do after getting admission to college? In first year, the main focus must be to build a solid academic foundation. Keep in constant touch with seniors, especially from your department. Also get information about the various clubs and teams that will open up in second year. By second year, you should have one or two extra-curricular activities to focus on. By then, you should also start looking for projects related to your interests either with profs in NITT or outside. By third year, you should seriously start thinking about your career. If you want to sit for placements, prepare well for interviews and take CPCs seriously. In case you want to go for Master’s or an MBA, plan out your preparation for that as well. It will include shortlisting professors from whom you will need recommendations and speaking to them about your aspirations. Final year will be a blur of activity if you sit for placements or if you are planning for postgrad studies. The rest of the time will pass in trips and college festivals.